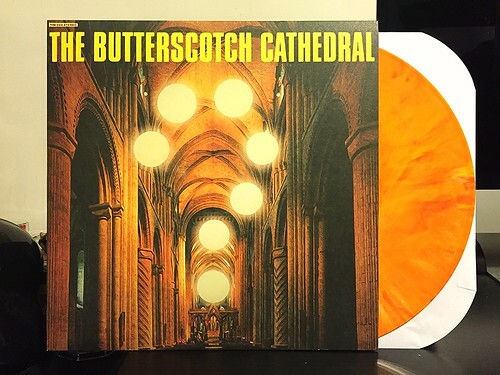 This Butterscotch Cathedral record is one that I had been looking forward to ever since I first heard about it. I was admittedly late to the party when it came to The Resonars, but I really enjoyed the soaring British Invasion style harmonies. Once I heard that Matt Rendon had another band and was putting out this album, I waited in anticipation and then ordered a copy the day it went on sale. After spending some time with Butterscotch Cathedral, I have mixed feelings. I'm not sure how to describe it other than I don't think it's bad, but I don't really enjoy listening to it. Many of the things that I like about The Resonars are here. Huge vocal harmonies mix in to predominantly upbeat and catchy songs. There's some nice guitar work and a rhythm section that can really get your head nodding from time to time. At the end of the day, I think these positives get lost in the meandering psychedelic aspects of the album. First off, this record is essentially three songs. Side A is one song. Though that song is then split up into seven sections. On side B you have one song called "Loud Heavy Sun" and then a second song called "Lisa's Dream." "Lisa's Dream," however, is then broken up into nine parts. I'm not entirely sure why the album is arranged like that, but whatever, that's not a deal breaker. What does drag the album down for me is the way the band sinks into these overblown and self indulgent moments of oohing and ahhing complete with swirling noise and over the top guitar solos. We've got some machine gun sound effects here and little dream sequences there. Looking for a call back to an earlier moment? Yep, it's got those too. While I can't say that the songs themselves are bad, I think the album is a little gimmicky and gets bogged down in extra noise that detract from the songs rather than enhance them. I've ended somewhat bummed out by the record. I wanted to like it more than I do but it looks like I'll just wait for the next Resonars album.